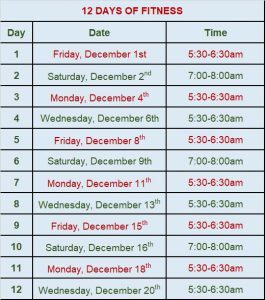 THE 12 DAYS FITNESS 2017!!! 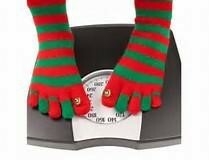 Statistically, you will gain on average 3-7 pounds between Thanksgiving and New Year’s Day! 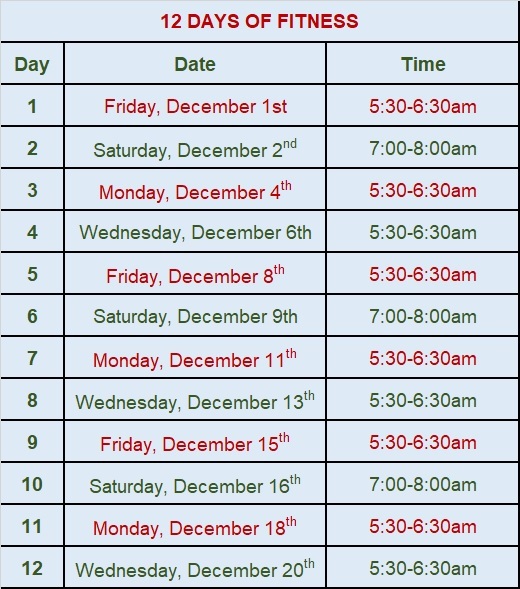 ZenRock Fitness offers its first ZenRock Small Group Training program so you can enjoy your holidays while maintaining your health and fitness goals. Tackle your New Year’s Resolutions with a head start! Team members who have the same objective as you! ZenRock Small Group Training program starts Friday, December 1, 2017 at 5:30-6:30am. Enroll now for our first ZenRock Small Group Training program for $199. Enrollment is limited to a pilot of 6 participants. This value-price is limited to the first six participants who sign on before November 29, 2017 for this ZenRock program.